Back again this year: The Halloween Sidewalk Parade! Parade participants meet at 5:15pm at the South Silo (behind the Union Bank) off of Depot Street. Come in costume, bring your friends, your brothers & sisters (younger and older), and your parents. Everyone is welcome to join in marching along. Bring a noise maker, musical instrument, or a dance if you have one. The Halloween Parade will be captured thanks to video courtesy of Meadowood Media. Make sure you stop by the Annual Halloween Photo Booth - now in its 8th year - the pillar of Halloween in Jeffersonville! 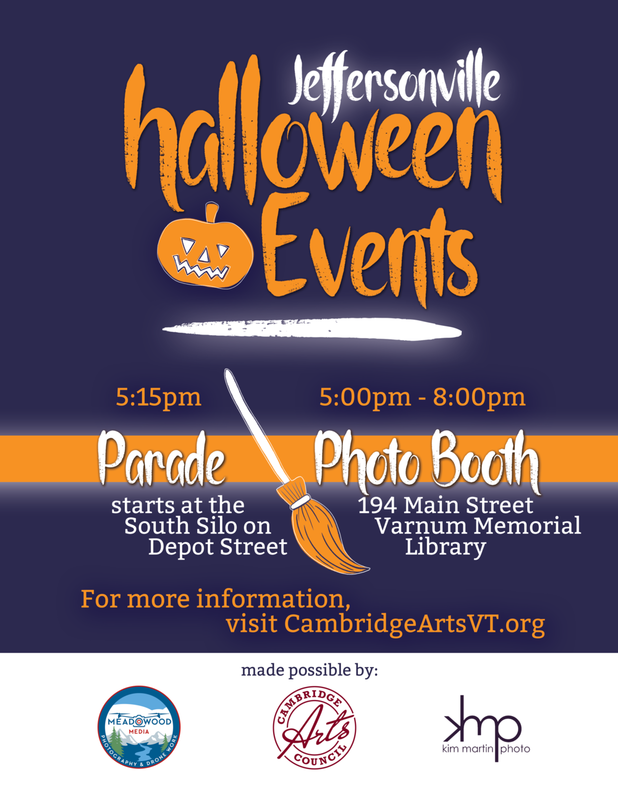 Join us at a new location - the Varnum Memorial Library at 194 Main Street! Kim Martin Photography and Emoji Nightmare will be on hand to snap those spooky outfits. How did the coyote get yellow eyes? Have you seen the Ghost of John? Does Bruh Snake bite? What makes things go bump in the night? Where did Halloween come from anyway? Find out on the porch of the Varnum Memorial Library (6pm-7pm) when international storytellers share traditional and contemporary stories to make your Halloween a spooky delight. For all ages.